The following additions where written by undersigned to the wikipedia ‘market socialism’ “talk” page, which is a page associated with the normal wikipedia page (where users find informations) about a topic where people interested in editing the wikipedia page can debate issues with each other. Nothing was added to the front end pages of Wikipedia, because it is forbidden to advertize your own work. It will be up to someone else to understand and help spread the truth about economics. It seems to me that the “fundamental principle” of ‘Socialism’ (including Market-Socialism) can be derived either historically or by the word itself, or better both. Social-ism, implies that the highest principle of society should be “to be social.” That then can be taken in various ways (by English language), such as (perhaps mainly): 1. to be a kind and considerate warm hearted person / society who cares for the poor and those who are hurting, or 2. to enjoy togetherness with others, to interact and to do things together. One may ask to what extend these two sides stand apart. To help with the analyses we can add history into the mix: when did those using the word come about, what did they protest, what did they want. The socialist labor movement roughly came into being from 1850, and was a reaction to the repression of the workforce by the “Capitalist” factory owners and financiers. The propaganda that the workforce was attacked with claimed that the Capitalist owners had every right to abuse the people as much as they did, because “it was the market principle,” and they where just better at it (etc). We also have a certain pressure from eugenics and Fascism, who outright claim that might makes right. If we then contrast these two broad movements: those claiming that they had the right to abuse the workforce because some sort of ideological theory, such as the market, or such as they are being the more violent and stronger who should rule over the weak and eventually replace them (eugenics), then get a reply from “the socialists,” who seem to claim “we will not accept *any* claim to whatever theory or logic, to justify the abuse and exploitation of people; we demand a ‘social’ kind of society.” You then see the socialists getting into every way that the suffering of the workforce could be limited, and that then leads to the development of many ideologies, or perhaps it is better to say that the socialists joined the search for a better system of society (etc), which then leads to ideas like: should the whole economy be under the State, or should we have co-operatives, and so on. 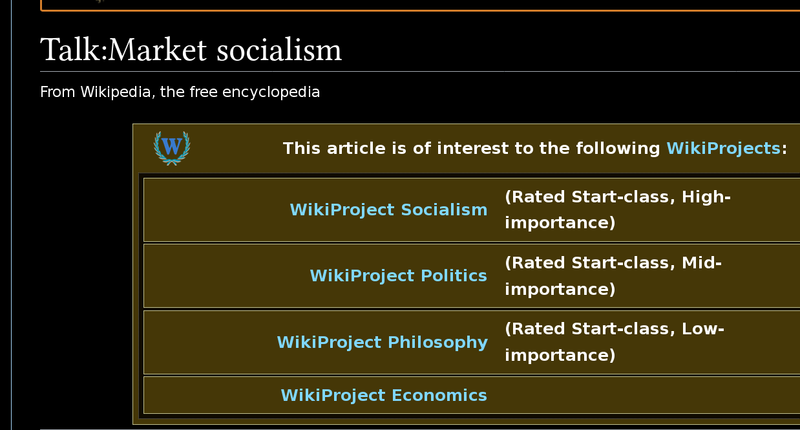 Added to topic: “free market socialism” — do “proponents” use this term? Hello. Since I am a proponent of ‘market socialism,’ serious enough about it to make it my life’s main work, and given the lack of even one example of such in above question, perhaps my opinion on it could be helpful (?). In the version of ‘market socialism’ I would like to see done, the market is truly free. There is freedom of initiative to start business, freedom to trade, to make contracts, to rent and rent out your soil at will, to set prices, and so on. The market will be more free than it can be under “Capitalism,” in which power centralizes and people are pressed in a corner to then sell their labor for much less than it is worth to the owning class. As such it seems to fit the ‘far end’ of market-socialism (as described on the page currently) with a free market, as opposed to one that is not so free, and hence the model I would prefer might qualify for the name “free market socialism,” as the page suggests. Indeed I find that a perfectly acceptable term, which I have used sometimes, but not often. The reason not to use it above “market socialism” is only because it is longer, and in my opinion the term “market” already should contain the necessary freedoms to set prices, make contracts, have initiative, etc. Technically speaking “free market socialism” might be superior, to differentiate from semi-market systems with arbitrary price controls or restricted individual freedom, and to stress that the market operation to find prices which dynamically adjust themselves to more or less fair value (which is how markets are generally understood to operate) is a key component of the system. I belief that ‘(free) market socialism’ should reject the Marxist principle ‘from all according to their ability, to all according to their needs,’ (which is admirable personal moral behavior and certainly fit for a family and within a co-operative business, but not enforcible on the grand scale of society) and substitute: to all according to their work (as achieved in the market), and (taxation) from all equally. This to stress that the market truly should be their own free-running system, which will have people who are more and less successful according to their effort and talent. It should however not get out of control, as it invariably does under Capitalism because it allows limitless accumulation of Capital. The exception can be made for cases falling under generalized insurance for sickness, the young and the old. The market as such is a social achievement, a trade is a free agreement to two persons, who overcome mutual violence by the procedure. Hence I agree with the page to call certain forms of market socialism “free market socialism.” I would *never* want to refer to a system of what I think society should look like as “anarchist,” or “mutualist,” even though in the most idealized and literal sense of those words that might be applicable. “Anarchy” as in ‘a society of equals’, could be applicable to a good society in a loose sense, however the anarchists push this to an extreme where judges, representative Government and police seem to become impossible. The direction of the anarchist movement is one that seems to stand strongly against objective and lasting structure and law. Even if that is not a necessity, in my experience that is what anarchists tend to champion. I find this a regrettable stance. I should caution first that I am the author of a version of what I loosely call ‘market socialism’, or ‘Distributism’. I hope it is OK I write something here, just on the talk page ? The system I have developed does not seem to be covered (yet) by its main characteristics. Obviously I will not edit the main page, but perhaps there are people editing this page that find it interesting. I think that economic general theory as currently thought is being superficial, because it is taught that *effort* creates market value (I will not go into the why of that here), which is correct. However the natural resources in their raw form are *not* the product of human effort. They do however constitute power points for those able to centralize their control. My conclusion is therefore that natural resources do not belong in a market, or at least not a market where ownership (as in total and ever lasting control) can move between people, and imply that some will own much or even everything while others own little or even nothing. The natural resources are the starting point of all work. It should therefore be available for all. However once the natural resources (loosely “the soil”) has been distributed, you can (and I think should) have rental markets upon that bases, as well as swap markets. Thus the benefit of markets in natural resources is retained, without the downsides of creating a landless and therefore powerless under class, who will slowly degenerate in every way, and through their degeneration become beholden to a ruling class. They become a class of serfs and canon fodder, unable through their generational slavery to see a way out. This part of the system would be the economics for the individual. I’ll try to be brief: economics for the group (business, group production) should try to avoid getting bogged down under business dictators, without destroying the ability of people to enter the markets as individuals, or to contract labor, thus becoming a business dictator. It seems wise to me that when the business starter leaves, the business will – when large enough – be forced by law to become co-operatively owned by the workforce. Then above that is the generalized economics (for the whole Nation), and on that front I belief that we need to stop the effect of for-profit business finance which seems it is most profitable where labor is abused (see what creates wealth above: effort, work the slaves harder and you are competitive in the markets). Hence investment credit needs to be mostly chocked off. Although it will become difficult to be extremely rich and lazy in this system, I would think it also wise to have a quite high private wealth maximum, since we cannot allow one person to own everything (which would be an absolute King). Such a measure is an anti-monopoly / cartel law with teeth. Furthermore business size should mostly be kept below 2000 full time workers as well, to keep the market open and dynamic. This should be coupled with a high end democratic system, more reliable than Parliament. I worked it all out in a 673 pages thick English book, which is 100% free PDF and source, all in the public domain, so I absolutely care nothing for any sort of profit and only for spreading correct economic ideas. My website is called: market. socialism. nl I hope it is OK that I point to that here ? There is a rather large amount of detail involved, which is impossible to put here. This is only a very short introduction, and does not even get into the reform / revolutionary model attached to it, or other facets like software. I chose the name ‘market socialism’ because I was rather lost on how to describe it, and this seemed to come closest. Sometimes I think Distributism could be better, however that has its own problems like “do you want to distribute wealth” (no). There are problems with any name, and market-socialism more or less seems to contradict. I do not use “free market socialism” because it is needlessly complicated, and ‘free market’ carries connotations of international free trade zones, which is not what this is about. There is no central planning board in the system as I propose it, just a normal Government role with separation of powers.